Staying in stylish and comfortable hotels we travel to some of Sri Lanka's greatest sights. From ancient Buddhist sites to lush hill-side tea plantations and fascinating historic cities, all with their own enchanting story. Our tour begins this afternoon in the small fishing town of Negombo. Located just 15 minutes drive from Colombo Airport we can check in and recover from the flight. Leaving the capital, our journey takes us northwards along the coast to the fishing port of Negombo. We will pause to visit a nearby fishing village where the catch is made in traditional style large outrigger canoes, known locally as 'oruvas'. We may also see the toddy tappers climbing tall coconut trees and collecting sap from the flowers to make Arrack, a local whisky type spirit. Our destination is a campsite based on the outskirts of Wilpattu National Park. We choose to visit this park, rather than the more touristy Yala National Park further south because we believe it offers our customers a better experience. The same animals can be seen here as in Yala, however it is less crowded, making our visit more enjoyable and responsible. We spend two nights here in fixed tents with beds, all linen and towels provided. Today we take two game drives in to Willpaththu National Park with a trained naturalist. Despite Wilpatu National Park's location in Sri Lanka's dry zone, it boasts nearly 60 lakes and is renowned for leopard, elephant and sambar deer spottings. The group will be split up in to jeeps and explore the park in the hope of spotting a leopard. Leaving Willpaththu we pause to view the magnificent Standing Buddha of Aukana, which stands 12 meters high. Sculptured in the 5th century by a master craftsman, it is still relatively isolated in its jungle setting. We then drive to Dambulla, where a great series of caves have been turned into temples (dating from the 1st century BC). We will visit five separate caves, which contain a large number of Buddha images and a few sculptures of Hindu Gods. In one of the caves there is an incredible Reclining Buddha measuring 14m long! This World Heritage Site is visited by crowds of worshippers. We reach our resort in Dambulla in the late afternoon. In the morning we drive to Sigiriya where we climb to the Sky Fortress. The ruins of this 5th century fortress are one of Sri Lanka's major attractions, a stupendous sight to behold and a feat of consummate engineering skill. A switchback series of steps and steel stairways (sometimes steep and challenging) ascend to the top. Halfway up, tucked beneath a sheltering overhang of rock, are the famous frescoes - the Sigiriya Damsels, their colours still glowing. Magnificent views can be enjoyed from the summit of the rock palace. After lunch we explore the ancient city of Polonnaruwa, which reached its height of glory in the 12th century. The city still has many interesting and spectacular buildings and monuments. There is the Royal Palace Group with its Audience Hall, Bathing Pool and Quadrangle - a very compact collection of ruins. Close by is the Circular Relic House, a curious round structure with a beautifully preserved moonstone carved at the foot of a flight of steps. Another famous feature of the deserted city is the group of carved images of the Buddha known as Galvihara. Here there are four colossal figures, all of which are hewn out of solid granite. Later in the afternoon we return to Dambulla. Lying in the mountains 112km northeast of Colombo, Kandy is, in climatic terms, a world apart due to its altitude of 500m above sea level. The town was captured by the British as late as 1815, and is known more for its cultural and spiritual importance rather than its history. Buddhists from all over the world come to this delightful old highland town, specifically to visit the Temple of the Tooth, the Dalada Maligawa. The costly jewelled shrine of the Holy Tooth (said to be 3.5cm long by 1cm thick and Buddha's left canine) is kept in the upper floor of the original building. This relic was brought from India 1,500 years ago and every year, at the time of the August full moon, it is paraded round the town with great pomp and circumstance. During this ten-night festival of Perahera, the Tooth (or a model of the original) is borne along on a richly decorated elephant, surrounded by saffron-robed monks and Kandyan dancers. Kandyan dancers can also be seen performing every night at one or two locales around town. 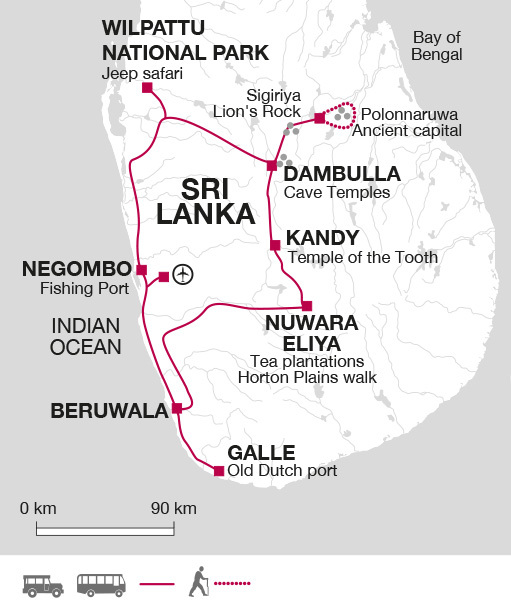 This afternoon's sightseeing includes attending the Temple of the Tooth Ceremony and a visit to the Peradeniya Botanical Garden. A full free day to continue your exploration of this charming mountain town or simply relax and enjoy the amenities at our hotel. This morning we head off across the highlands, through green rolling hills covered in tea plantations, visiting a working tea factory en route to the hill station of Nuwara Eliya. After checking into our hotel we'll take a tour around this little town, known as Little England, famous for its lake, golf and race course and well manicured gardens. We head out this morning to Horton Plains, situated on Sri Lanka's highest plateau between altitudes of 2000m and 2300m. Traditionally named Mahaeliya, the park's main attraction is the thrilling escarpment known as World's End which offers stunning views across the tea plantations. We aim to trek to World's End in the morning when the air is clear and the views are best. Although the area is now devoid of elephants, we may be lucky enough to see other flora and fauna such as sambar deer. Returning to the hotel in the early afternoon, there is time to refresh and relax; maybe even a round of golf on the adjacent golf course! Today we make our way to the coast and the pretty town of Galle. Although there is still evidence of damage from the 2004 tsunami all along this coastline, the international relief effort has put the area on a fast path to recovery; and the brand new infrastructure is allowing local communities to benefit from tourism once again. In the late afternoon we visit the old, walled town of Galle itself. Important as a trading port for the Portuguese since the 16th century when the fortress was constructed, it has undoubtedly been a trading centre since ancient times. Galle has a variety of activities and attractions to occupy your free time. You may choose to hire snorkelling equipment and explore the corals or take a sea trip around the coast. Alternatively travel up river past small largely uninhabited islands. There is plenty to see particularly in the old fort area, which was designated as a World Heritage Site in 1988. Overlooking the sea, the fort ramparts protect the harbour, old houses, churches, warehouses and the Arab quarter. Between December and April there may be the opportunity to go on a whale watching trip from nearby Mirissa. In the late afternoon we drive up the coast to Beruwala. Today is left free to relax on the pristine beaches of the west coast. For those seeking pure relaxation, local Ayurvedic massages with natural, aromatic herbal oils are highly recommended. Our final day is spent relaxing on the Indian Ocean coast. However, if you feel like exploring further we recommend a trip into Colombo by train for more sightseeing and shopping. This morning we will travel back to Colombo where the tour ends at the airport. Kandy - Cultural Show £5. Whale Watching - US$ 95.00pp (min 4 persons). Select your clothes carefully, bearing in mind that the climate is tropical and that upland areas are cooler and more temperate. Lightweight rainwear is also essential, and warmer clothing for the highland walks and chilly night temperatures in the mountains. When visiting religious sites you will need to dress respectfully by covering you knees and shoulders as well as taking off your shoes and hats. You may like to wear socks for temple visits as the ground can get very hot and burn the soles of your feet. You will need to bring long trousers, or buy a sarong locally. Lightweight shoes and sandals.You may consider taking some walkingshoes/boots for the visit to Hortons Plain. One main piece of baggage and a daypack. Remember, hotel porters are not always available, so don't overload yourself. A water bottle is recommended for walks. There are leeches in the highlands and you may wish to consider bringing leech socks with you. In this area, tipping is a recognised part of life. Although Explore pays most gratuities for the smooth operation of the tour, some local staff will still look to members of the group for personal recognition of particular services provided. Accordingly, you should allow £40 for tipping. Your tour leader will account to you for any organised tipping. Sri Lanka: All foreign nationals who intend to visit Sri Lanka for a short stay of up to six months, including transit passengers, must apply for travel authorization online prior to travel to the country. To obtain an Electronic Travel Authorisation (ETA) you must visit http://www.eta.gov.lk to apply for it prior to travel. It is strongly recommended that you print and bring a copy of the ETA approval notice with you. The Sri Lankan authorities require that your passport must be valid for at least 6 months after departure from Sri Lanka. This trip is offers the chance to see elephants in the wild, climb to Lion Rock's ancient fortress and relax on quiet beaches while staying in premium accommodation. The trip focusses on some of the best highlights of Sri Lanka and is ideal for travellers interested in history, culture and wildlife. There is plenty of sightseeing as well as free time for you to experience this increasingly popular destination or to simply relax.